As a journalist, I'm always hesitant when people ask me what the "best" restaurant is; firstly, my best is probably different from your best, secondly, with so many types of cuisine, how can you lump them all together and declare one the most superior? So, with that, I usually offer my opinion of the "best" restaurant of a particular cuisine in a specific neighbourhood. And even that's a challenge. I've been to hundreds of restaurants - both personally and professionally - and it's just too hard, and unprofessional, to pick a "best". But, I do have my favourites, as anyone would, and those are the restaurants I will always recommend to others. It's no secret I love sushi. Correcton: I LOVE sushi. Just over 10 years ago, a new sushi restaurant opened in Woodbridge and I became one of their regular customers. So regular in fact, I was one of the first few to receive a VIP card, the owners recognized my voice when I called for a reservation, my photo was added to their "Wall of Fame", and they even catered part of our wedding reception in 2009. Koganei Japanese Seafood Restaurant remains one of my top favourite restaurants. 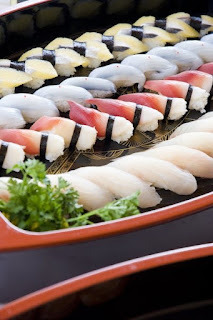 The sushi quality is bar none - the fish is always fresh, good portions, made a la minute and tons of variety. And if you're not a sushi lover, there are literally hundreds of other options on the menu - of which I (and my friends and family) have tried almost all. My top picks: Stir-fried clams, sirloin wrapped asparagus, seaweed salad, chicken teriyaki, noodle soup - I could go on. The owners - brother and sister duo Daniel and Sara - are lovely people, very generous and kind. They always take a moment to come and say hi and inquire about your day, your family, your life. Just last week, Sara messaged me on Facebook to tell me they made a...wait for it....Julia Suppa roll! I couldn't believe it; I was shocked and honoured and thrilled all at the same time. That day, with two of my best friends and fellow Koganei lovers, we went to try my roll. The Julia Suppa roll is a complex roll (no kidding!). 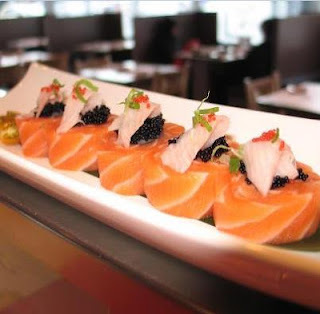 In the centre is a sweet shrimp, wrapped in salmon sashimi, topped with black and red roe and further topped with hamachi (white tuna), thinly sliced onion and more roe. Phew! It is so unbelievably yummy and sweet. I love it, which is good, because it is my roll. It's not officially on the menu yet, but if you ask for it, it's available. Go try it and see for yourself - maybe you'll catch me there.